John Jay Osborn Jr., J.D. ’70, and his daughter, Meredith Osborn, J.D. ’06, reflected on how the law school had changed during the past 40 years. At a time of substantial change in legal education and the profession—in which the careers of law-school graduates develop in increasingly varied, often global, professional contexts—Harvard Law School (HLS) kicked off its “Campaign for the Third Century” on Friday, October 23, with an afternoon of speeches and panel discussions that hinted at some of these transformations in practice and pedagogy. 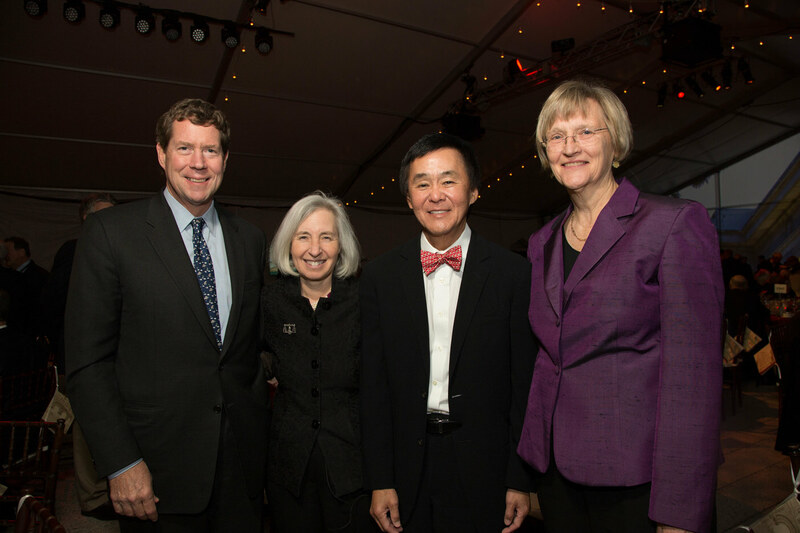 Later, during a gala evening dinner featuring speeches by Harvard president Drew Faust and HLS dean Martha Minow, campaign co-chair James A. Attwood Jr., J.D.-M.B.A. ’84, announced a campaign goal of $305 million, of which he said $241 million (79 percent) had already been raised in “the silent phase.” Minow announced a campaign-leading $15-million gift from Michael R. Klein, LL.M. ’67; the school will soon add his name to what is now the Berkman Center for Internet and Society. 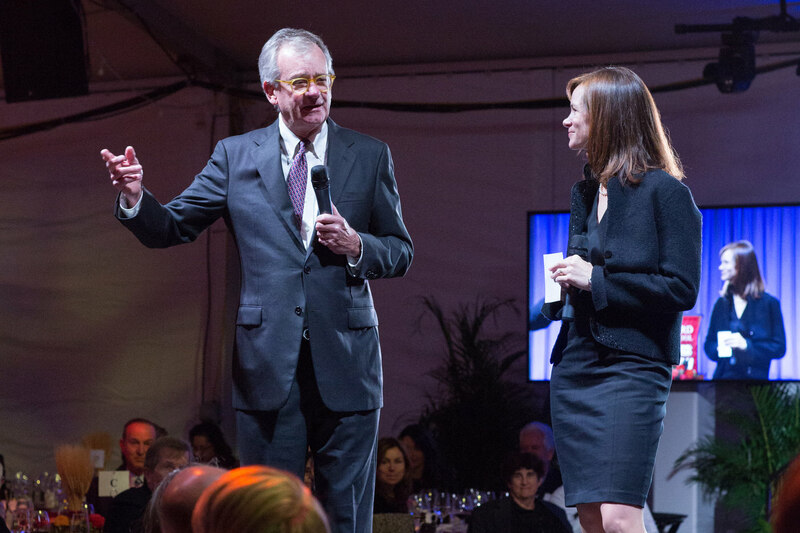 (There were also appearances by CNN analyst and New Yorker staff writer Jeffrey Toobin ’82, J.D. ’86, as master of ceremonies; The Paper Chase’s author, John Jay Osborn Jr. ’67, J.D. ’70, formerly a professor of law at the University of San Francisco, who said that “HLS is in the DNA of law schools across the country”—literally, the “mother of all law schools”; and his daughter, Meredith Osborn ’02, J.D. ’06, who compared her student experience to her father’s, concluding that HLS remains a “challenging” place, but not the fearsome one depicted in his novel). Campaign priorities include financial aid and clinical education, both deemed critical to the school’s mission of advancing justice, increasingly among the underserved. 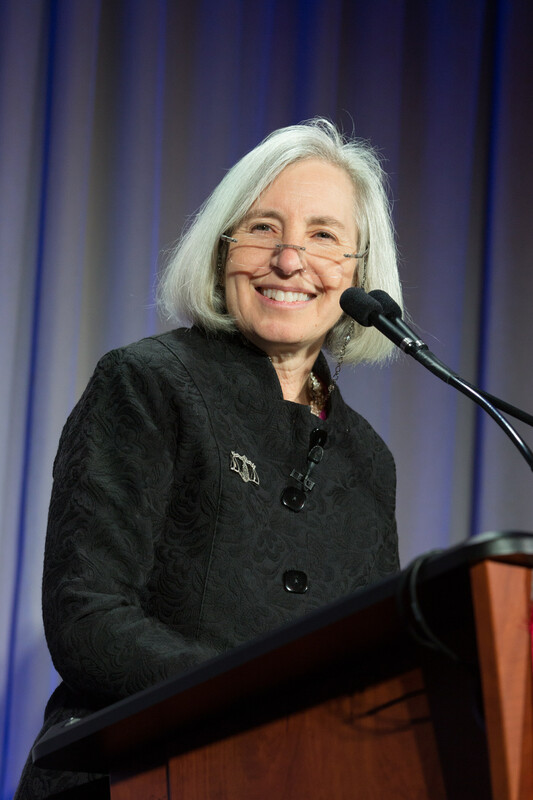 Since becoming dean in 2009, Minow said in an interview before the campaign launch, she has nearly tripled spending on financial aid (Harvard and Yale are the national leaders in extending need-blind admissions not only to J.D. students, but to all LL.M. students, says Stimson professor of law William P. Alford) and loan forgiveness (for J.D. students who enter nonprofit careers after graduation). “We want any student who is qualified to do the work here to be able to come to Harvard Law School, afford the education, and be able to pursue any career that they want,” she asserted, “and so we carry that as a cost. We don’t have a cap on it, and it is central to our mission.” Likewise, clinical education, in which students receive hands-on experience in the law, often by working with low-income clients, has become increasingly important in the curriculum. But such pedagogy is costly, she pointed out, simply because of its low student-to-faculty ratios as compared to lecture classes. The school’s commitment to such teaching is longstanding, however. Its previous campaign, which aimed to raise $400 million (and exceeded that goal handily by its 2008 conclusion) helped to build Wasserstein Hall, a structure the size of Yale Law School that houses in one wing the physical space dedicated to clinical education. Nationally, she added, a substantial number of recent graduates are not finding work in law that requires them to have passed the bar. But she said the picture is more nuanced than this statistic suggests, because changes in the workforce have led to new kinds of work for people with legal training, even if that work doesn’t involve traditional legal practice. Minow chairs the steering committee of the Association of American Law Schools, enabling her to see the entire landscape of legal education in this country. “Many law schools are hurting and many law students are having trouble,” she acknowledged, even though HLS students, though not entirely unaffected, “are really not in that same position. Our students remain in great demand.” But there are changes in the profession, in what it means to be a lawyer and practice law. Ultimately, the lessons of this effort will help train students and practitioners for a changing legal landscape. “International and comparative perspectives are fundamental to what it is to be a lawyer in the twenty-first century,” Alford continues. For that reason, every first-year J.D. student must take a course about a legal system other than that of the United States. Alford says this immediate requirement makes a large impact in broadening student perspectives, because they “learn another way of thinking about law and legal institutions.” Examples include courses on the legal architecture of the international economic order or on a particular country. Alford himself teaches a course on China’s project of legal development. Enriching the dialogue at HLS, meanwhile, are students from more than 70 different countries. “I tend to think diversity of all kinds has much value. The type internationalization brings has benefits that sprinkle far beyond just the international itself,” he says: it broadens students’ ability to understand how others see the world, and “to envision what their hopes and problems are.” International perspectives also permeate faculty work, whether on issues of disability (Alford chairs a project that helps countries develop legal frameworks for ensuring the rights of persons with disabilities), on family law (including cross-border adoption), or on real-estate law (which 40 years ago, he says, one wouldn’t have thought would take on a global dimension). Illustrating that point, Senator Mark Warner, J.D. ’80, of Virginia kicked off the campaign-day luncheon by saying, “I’ve never practiced a day of law.” A businessman (he founded Nextel) and later a politician, he outlined some of the big problems facing the country for an audience of HLS alumni, faculty members, and students. He spoke passionately about the national debt—and on the need to spend money now going to interest payments on that debt for education, infrastructure, and research instead. He also cited the need for “great legal thinkers” to solve present and future problems, such as the “complicated and inefficient U.S. tax code” and the problem facing successful millennials who have joined the workforce in vast numbers but don’t work in traditional jobs with benefits and safety nets. What, he asked, might happen to them in the next economic downturn? After lunch, the assembly broke up to attend concurrent presentations on international human rights, corporate governance, the making of a civil-rights lawyer, and the veterans legal clinic (founded in 2012 with twin goals of pedagogy and service). These were followed by TED-type talks, 10 minutes or less each, by faculty members: Klein professor of law Randall Kennedy spoke about what the civil rights revolution from 1950 to 1970 has bequeathed the country; Berg professor of law Mark J. Roe discussed “short-termism” in corporations, driven by the stock market; Warren professor of American legal history Annette Gordon-Reed discussed black citizenship in the context of the events in Ferguson; Reilly clinical professor of law Susan Crawford discussed how cities are making themselves newly visible and accountable to citizens through data; and professor of law I. Glenn Cohen, faculty director of the Petrie-Flom Center for Health Law Policy, Biotechnology & Bioethics, discussed some of the ethical conundrums raised by the globalization of healthcare.